I love how colorful this is. It’s Spincerely roving in a beautiful 60/30/10 superwash merino/bamboo/nylon blend. The color is called Stained Glass, and each turn of the wheel brings out new colors, new hints of shades I never noticed. I am so thankful that I bought up the full 8 ounces of this colorway! I’m planning on using it for a baby sweater, and think I’ll have sport/dk weight yarn. Any pattern suggestions? It has been over 6 months since I last pulled out the spinning wheel. I had the sudden urge during the superbowl and sat watching and spinning away…. The roving is from Cloudlover and its a 50% Merino/50% Tencel in the Decay colorway. The colors muddled up a little more than I would have liked them to, but overall, its a pretty nice “first spin in forever” skein. I think I’ll let this one sit for a while before it gets knit up. Spinning is so meditative and when I’m super crazy busy, it feels good to sit in front of the fire and spin away. Now, what to spin next?! The first is a superwash Merino/Bamboo/Nylon in the Lilith colorway from Spincerely. I love, love Tamara and she has a gorgeous color sense. But…. yes, there is a but, I totally screwed up how I spun this. I didn’t want huge blocks of color, and that is what I got! Owell, its a learning experience :) I believe that this is a dk/worsted weight yarn and has about 179 yards. I dyed up some of my Superwash Merino roving in the Luna colorway, and spun it, as a birthday present for a good friend. I love how this came out – though I was hoping for something a bit thinner. I ended up with about 170 yards of dk weight yarn. She loved it and that of course made happy! It’s my new Merino/Tencel roving in the Unbreakable Vow colorway. I don’t normally hide stuff away for myself when I dye things for the store, but I couldn’t resist! Three weeks of mad dyeing all done! Now, I can enjoy Rachel, Peter and Amelia’s visit.. they arrived yesterday and are staying until Monday. She is just so, so cute – I can’t wait to show you some pictures after the weekend! 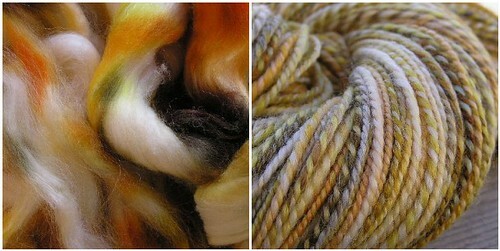 I spun up a little 1.2 ounce leftover piece of my Sunshine Yarns SW Merino Roving in the Smoke colorway. I loved this colorway and needed to spin up some for Scott. I only have 76 yards of worsted weight, so I will have to stripe it with maybe some black for a hat. A few weeks ago I pulled out a little 1 ounce sample that was part of the Be Mice Elf Wildflowers Collection. It was late and I was tired. I quickly became frustrated and rushed through this mini piece. But, its still sweet and will make a nice baby hat. I have about 61 yards of sport/dk weight yarn in the Marigolds colorway. Also, some very cool things are going on in the Sunshine Yarnies group on Ravelry. A wonderful customer of mine (cabinfour on Ravelry) has started a Spring KAL (knit-along). You can head to the group to see all the details, but the general idea is that you begin and knit a project using any Sunshine Yarns yarn in the month of April. As long as you post a finished project picture to the KAL thread by May 1st you are entered in a contest to win some prizes! Its fun and easy-going and the thread is a great way to be involved with Ravelry! I am joining in with the KAL and started up a new project today. You’ll have to go to the group to check it out in the meantime.